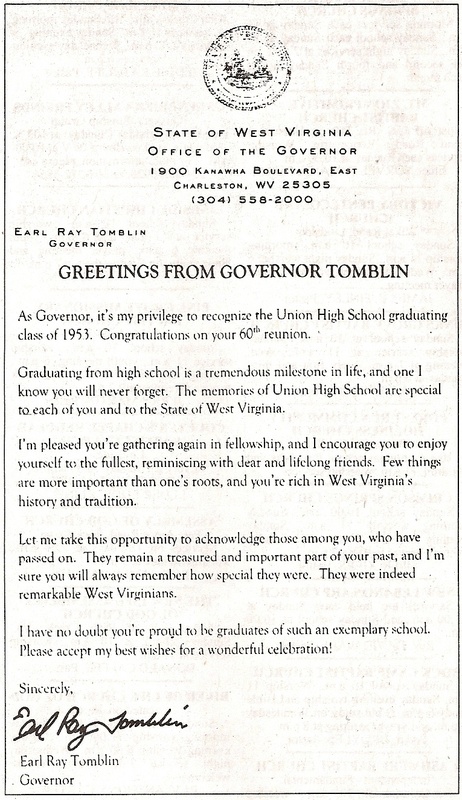 The Union High School Class of 1953 met on June 24, 2013 to celebrate their 60th Class Reunion at the Kalico Kitchen Restaurant in Union. 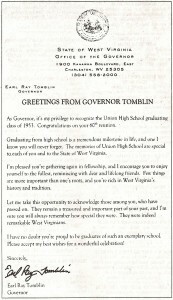 The Governor of West Virginia, Earl Ray Tomblin sent a congratulatory letter honoring their class achievement for their 60th Class Reunion. The Luncheon and Social was enjoyed by class members, spouses and guests. Those attending were Garnet Bowyer and wife Alberta, Wedsel Boyce and daughters Jackie and Debbie, Kellen Burdett, Venecia Elmore Arbaugh and husband Paul , Cecil Hinkle and wife Mary Ann, Jack Humphreys, Bill Hylton, Frances Johnson Cain and Darrell Wickline. Guest were; Josephine Elmore Mullins and Jean Johnson Clark. Those unable to attend were; Austin Bradley, Jerry Crosier, Isabell Boggs Fogus, Betty Weikle Pomphrey, Bill Talbott, Kelly Morris, Gloria Persinger Krick, Charles Roach, Billy Joe Boggs, June Boggs Lucas, Karen Dransfield Mitchell, Dottie Hedrick Sealy, Merle Jenkins Burns, Patty Martin Patton, Dr. Robert Ruddell, Virginia McClung Bowyer Bliel and Norma Rudisill Kawalski. The deceased class members are; Wanda Dixon, Dorothy Dunbar, Joyce Beckner Hill, Mary Jane Meadows, Harold Mohler, Annalee Pyne, Betty Smithson, Mary Humphreys, Marvin Vance, Herman Jackson, Eleanor Hinkle Pomphrey, Robert Mallamus, and Jimmy Walker. 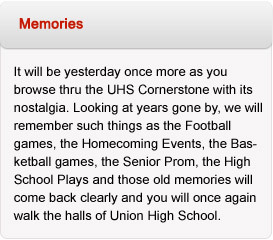 A class picture is not available for this article but the picture below is a picture taken when the UHS Class of 1953 celebrated their 50th Reunion. The Class gathered on June 6, 2003, at the Kalico Kitchen in Union for their 50th celebration. The meeting included social time, a great meal, introductions, awarding of prizes and taking photographs. The class members, spouses and guest attending were; Eileen Skaggs (teacher) and husband, Wedsel and Marie Boyce, Garnett Bowyer, Kellen Burdette, Dale Mohler, Jerry and Margie Crosier, Paul and Venecia Elmore Arbaugh, Dottie Hedrick Sealy, Cecil and Mary Ann Hinkle, Jack Humphreys and wife, Clyde and Mary Evelyn Hylton, Louis and Frances Johnson Cain, Robert “Buddy” Mallamas and wife, Kelly Morris, Sr and two guests, Pattie Martin Patton, Bill and Gloria Persinger Krick, Bill and Dorothy Talbott , Earl and Betty Weikle Pomphrey, and Darrell Wickline. Those not attending; Billy Joe Boggs, Isabelle Boggs Fogus, June Boggs Lucas, Eleanor Hinkle Pomphrey, Karen Dransfield Mitchell, Virginia McClung Bowyer Bliel, Merle Jenkings Burns, Herman Jackson, Dr. Robert Ruddell and Norma Rudisill Kawalski. The deceased members of the class at that time; Wanda Dixon, Dorothy Dunbar, Joyce Beckner Hill, Mary Jane Meadows, H. H. “Harry” Mohler, Annalee Pyne, Betty Smithson, Jimmy Walker, Mary Humphreys, and Marvin Vance.